Now available on Ravelry as a free PDF download. You must be a Ravelry member to access the site. Also available as a free PDF here (132 Kb in size). 12 sts over 10 cm (4″) on 8 mm (~US 11) needles over stocking stitch (row tension not important). Long pins for holding knit pieces together when sewing up. With 6 mm needles, cast on 28 sts and work 4 rows garter stitch (knit every row). 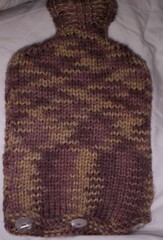 Change to 8 mm needles and, beginning with a knit row, work in stocking (stockinette) stitch for 23 cm/9″ from cast on edge. End after a purl row. Knit to within 3 stitches of the end of the row. TURN. Purl to within 3 stitches of the end of the row. TURN. Knit to within 6 stitches of the end of the row. TURN. Purl to within 6 stitches of the end of the row. TURN. Knit to within 9 stitches of the end of the row. TURN. Purl to within 9 stitches of the end of the row. TURN. Cast off 9 stitches, K to end of row. Change to 6 mm needles and, beginning with K2, work in K2, P2 rib for 16 rows. With 6 mm needles, cast on 28 stitches and work two rows in garter stitch. Buttonhole row: K4, yo, K2tog, K8, yo, K2tog, K8, yo, K2tog, K2. Work “shoulder” shaping and “collar” as side one, but beginning the collar ribbing with P2. Fold buttonhole flap at purl turn row to the RIGHT SIDE of Side Two. Pin in place. With knit sides together, pin and sew the two sides together along side seams, shoulders and collar (sides and top). Leave the bottom edge unsewn. Sew buttons on using buttonholes as a guide to placement. Use one ply (or strand) of the yarn used or matching cotton thread. If you have any questions (or, shock horror, spot any errors) feel free to leave me a comment or send me an email. If you do use this pattern, please consider donating either a knit item (this one?) or some money to the charity of your choice. My personal favourites are Medecin San Frontieres/Doctors Without Borders and the ME Association. EDITED: Anne had some Aran-weight yarn in her stash. I have a calculator. The numbers below are for 18 sts = 10cm/4″. Just substitute in the relevant places! Buttonhole flap – cast on 42 sts, g. st. 4 rows. 4 rows of g.st. or st. st.
St. st. and then as before. Yay! too bad I don’t have any wool of the right weight. If only I’d known when I put in my yarn order yesterday. Oh well, reason to shop, right? 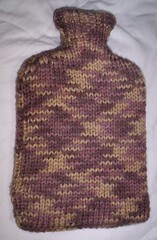 I was just looking at a knit water bottle cover in the store, thinking someone must have a great pattern for one of these… Thanks! Thank you so much for sharing this great pattern! I have already printed it out and will definitely try my hands at it! time seeing one thank you again. Thanks for the pattern . I was just thinking that i needed something for my water bottle , i was getting really sick of using a towel it just never seemed to stay in place . this looks like it will work great. Thanks for the inspiration! Have been amking up my own patterns but this is different. Thanks for this free Pattern. Entering for a competition in the Women’s Institute and covers go to the local Rest Home for the elderly. Thanks for the Hot Water Bottle Cover. It will save me going into the loft and hunting for my old patterns. I will have to sort them out. I know I have one somewhere up there. Thanks again. Thank you for the comment. I’m sure you’re correct that you should end up with 16 sts. I wrote the pattern a long time ago when I was new to designing and I’m afraid I didn’t have anyone check it over. 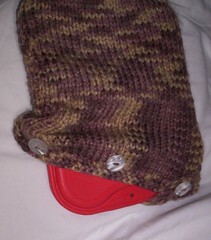 In addition, I don’t even have the original hot water bottle cover any more! I made it for a swap and sent it off to pastures new just after I’d made it! Thank you for bringing this error to my attention and I hope I didn’t cause you too many hair-pulling moments. If there’s anything else I can help you with, just email me. Is this for the tiny hot water bottles or full size? Thanks for the question; it is for a full sized water bottle. Thanks! I guess I’m just not using bulky wool so it looks a bit small, but it will stretch. I’m a fairly new knitter and just finishing up the first side of this. Amy, I want to use your pattern, but the glorious wool I’ve found is double knitting wool. If I use 4.5mm needles with this wool, how many extra stitches should I have? Would you say double the amount? And then adapt the neck to fit?